Throughout the chat, Namath came off as confident, never downplaying the accolades the talk show host was feeding him. Always charismatic, Namath squeezed a lot of anecdotes into the short sit-down. Namath described his "Broadway" nickname, playing in New York and an early "Sports Illustrated" photo shoot. At the eight-minute mark Letterman pulled out a copy of Namath's 1965 Topps rookie card. From there, the Jets great went on to explain how the photo on the card was taken at a hospital. Having just had his first knee operation, the team's media manager brought a Jets jersey, pads and football to Namath, who put them on, leaned up against a wall and the rest is cardboard history. When the conversation switched to the new Super Bowl Legends program, Namath seemed to lose a little of his confidence. Clearly he knew more about the game than the interactive trading card program he was brought on to promote. Still, the spot put a major spotlight on the hobby and brought it to a massive audience. 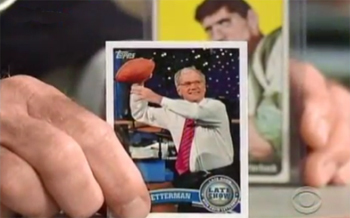 The spot ended with Namath presenting Letterman with his very own custom 2011 Topps Football card. It shows the late night host going back for a pass, decked out in a shirt and tie. The placeholder for the team logo has been replaced by a Late Show logo. Afterward, there was a short bit with Namath going outside to pass a football to actor Alec Baldwin, who had been on the show earlier in the evening.